The world of water investment is getting crowded. The Palisades Global Water Index is a modified equal-dollar weighted index comprised of companies worldwide that are engaged in the water industry. The benchmark Index includes international companies traded on major stock exchanges around the world. The component companies are positioned to benefit from the rapidly accelerating water resource challenges associated with the demands of growing world economies in conjunction with human health and ecological sustainability. PIIWI is rebalanced on a quarterly basis in March, June, September, and December. Currently, the index consists of 41 stocks from 14 countries and regions such as China, Finland, France, Germany, Hong Kong, Italy, Japan, the Netherlands, Singapore, South Korea, Spain, Switzerland, the United Kingdom and the United States. According to the fund’s prospectus, PIO invests at least 90% of its total assets in stocks that comprise the Palisades Global Water Index and ADRs based on the stocks in the index. The fund seeks a 0.95 or better correlation over time between the fund and the underlying index. 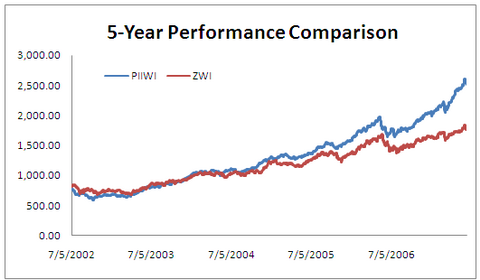 Following is a chart that compare the 5-year performance of PIIWI and ZWI. Clearly, the extraordinary growth of international stock markets in recent years has given PIIWI some boost in performance. And at an expense ratio of 0.75, PIO is not much more expensive than PHO, which has an ER of 0.67%. I currently own PHO and am quite happy with its performance (YTD return 9.81%, one-year return 29.97%) . However, it seems to me that despite PHO’s proven record in water investment, it will not only face competitions from funds like FIW and CGW, but from its in-house rival PIO as well . I actually picked up some PIO early this week. I have been thinking about getting some water into my portfolio but I’ve been dragging my feet. But I do like the more international exposure this new ETF has so I’m testing the waters with it (pun intended). I think PIO should perform better than PHO because of the international exposure. Though I have been investing in PHO for quite a while, I wonder if I should switch to PIO when I make new purchase. Water ETF looks promising for the long run.